Over a thousand people armed with sticks, stones and torches, who took to the streets of the Kyrgyz capital of Bishkek on Monday, have been dispersed. According to reports, two people have died and several were injured. The riots began after a group of people tried to seize about 700 hectares of land in Bishkek’s outskirts. The rally participants have retreated to the land, which they claimed last week, intending to stay there until the seized territories were allotted to them by the authorities. “If the city authorities are saying that there is no land in the city, it should be taken outside of its boundaries and urgently legalized,” said one of the speakers at the rally, warning that the land seizures will continue. However, as RIA Novosti news agency reports, the landowners drove the rioters from the area they tried to occupy, which angered them and prompted them to move to the capital. According to some media reports, they set some cars on fire and stoned a police building in the village of Mayevka. The riots were also marked by an anti-Russian mood: “We have been told that there have been calls against Russians and Russia," press attaché of the Russian embassy in Kyrgyzstan, Viktor Kharchenko, told Interfax on Monday. The diplomat has confirmed that the rioters were in an “aggressive mood” and the riots occurred after attempts to seize land. “The acting mayor of Bishkek is trying to hold talks with them. Several thousand squatters have gathered there. However, they are not inclined to hold any talks,” added Kharchenko. The provisional government has denied claims of anti-Russian moods among demonstrators. In an interview to Interfax, the head of the office of the acting prime minister, Edil Baisalov called those allegations an ‘absolute lie’. “We are paying close attention to this [ethnic] issue and have warned everyone that the interim government will not reconcile itself with manifestations of ethnic discord and will take the toughest action,” said Baisalov. He has stressed, however, that the interim government is “taking very seriously” the Russian Foreign Ministry statement, which urged the Kyrgyz authorities to guarantee the rights of the Russian-speaking population. Baisalov also reassured that a special envoy for ethnic relations has been appointed. The police, which the interim government earlier claimed was under their control and on their side, have staged another rally in southern city of Osh. As Itar-Tass reports, about 1000 policemen, which are holding a rally in the city’s central square, demand to observe and protect their rights, build up social security of police and stop taking advantage of policemen for political purposes and to dismiss acting Interior Minister Bolot Sherniyazov. The city’s acting mayor proposed to the police submitting their demands in a written form to solve the current problems. Meanwhile in the southern city of Dzhalal-Abad, a rally in support of the ousted president and his family has been held. About 1000 of his supporters who gathered at the central square demanded to stop the persecution of Bakiyev’s family. The demonstrators also called for an international investigation into Kyrgyzstan’s bloody unrests that took the lived of over 80 people. At the same time, in the country’s Chui Region the relatives of those killed in the violent clashed staged a rally, demanding a trial against the ousted President Bakiyev , his brother Zhanyshbek and other high ranking officials, who allegedly were responsible for ordering to open fire at demonstrators. Many voiced dissatisfaction with the interim government, blaming them for permitting Kurmanbek Bakiyev to leave the country. According Kazakh Foreign Ministry, ousted Kyrgyz President Bakiyev has left neighbouring Kazakhstan, and his current location is unknown. “As far as I know, Bakiyev has left the territory of Kazakhstan. We do not know where he is going,” said Foreign Ministry spokesman Askar Abdrakhmanov . He said he is also sure that Bakiyev left together with his family. Last week, Bakiyev has left Kyrgyzstan and took refuge in Kazakhstan where, according to the ousted president, he had been invited to by the Kazakh President. Is Belarus hosting the ousted President? 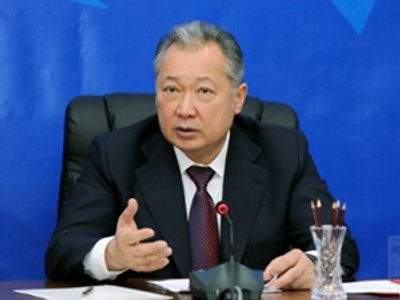 Earlier it was reported that Kurmanbek Bakiyev faxed a resignation letter on Friday from Kazakhstan to the new authorities. However, his brother Akhmat has continued denying those reports, saying that the duty of the former head of state is to call early presidential elections. 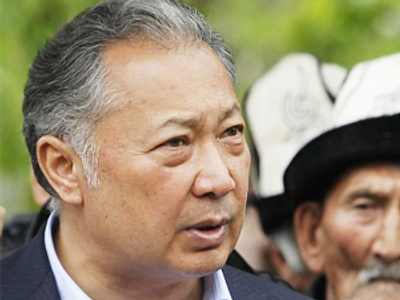 “If the situation in Kyrgyzstan is to be returned to the realm of law, Bakiyev must return to his office and issue a decree setting a date for presidential elections,” Akhmat Bakiyev said in a statement, circulated by the local media on Sunday. Meanwhile, the interim government said they have opened a criminal case against Bakiyev and that they are planning to initiate an international investigation into the alleged crimes, committed by the ousted President. “A criminal case was opened three days ago on several charges, including not only killings [of demonstrators] in Bishkek on April 7, but also other aggravated counts related to abuse of power,” said Azimbek Beknazarov, deputy prime minister of the Kyrgyz interim government. The new government has also launched a special operation to seize Bakiyev’s brother and ex-security services chief Zhanushbek Bakiyev. 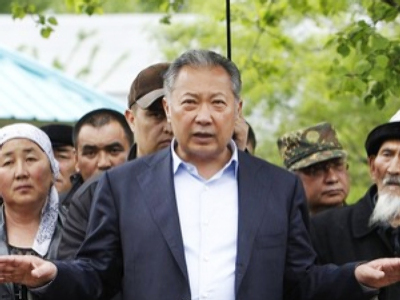 “Zhanybek Bakiyev has failed to keep his word and has not surrendered, and therefore police and special services are conducting a special operation to detain him in the Dzhalal-Abad region,” Azimbek Beknazarov, deputy prime minister of the Kyrgyz interim government, told journalists on Saturday. Zhanushbek Bakiyev is accused of ordering to open fire at demonstrators during the April 7 riots.